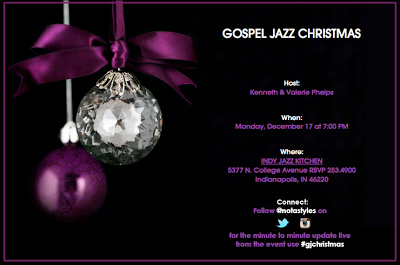 Tonight, there will be a fusion of Gospel and Jazz to make for a wonderful musical Christmas and Holiday event at the Jazz Kitchen in Indianapolis, IN full of food, laughter and fun! The show has an extraordinary line up filled with some of the best musicians from around the midwest region. Some of the artists and groups that are performing are listed here: Landis Archey, Vicki Brown, Brian Kelly, Kim Kenny, Valerie Phelps, Brian Reeves, John and Libby Ray, Joy Westbrook, Pam Westbrook and special guest Soul Purpose with more surprises to come. The band will consist of Jeffery Thomas II, Will Amos, Deron Bell and Adam Thompson. 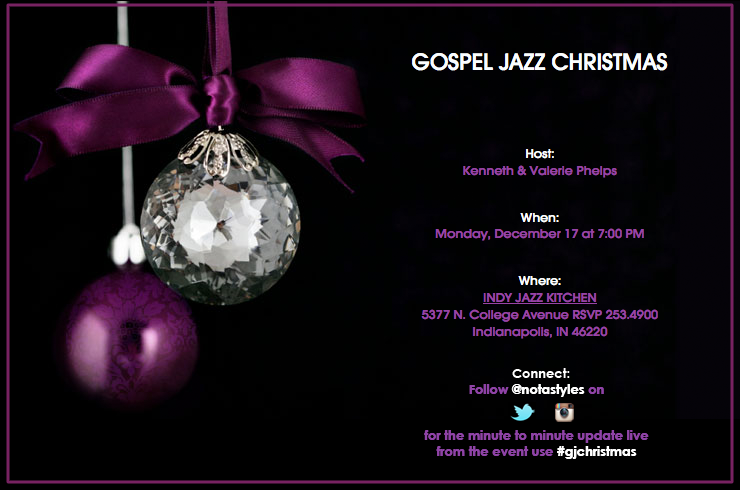 There will also be performances from Jazz legend Evertt Greene and the soulful sounds of Cynthia Lane. This will be one of the best musical events to be held before the arrival of 2013 and Notable Styles and More hopes that you will be able to attend. There will be two wonderful performance times one at 7pm and one at 9pm. To RSVP contact 317.253.4900, price is $12.00. Follow Notable Styles and More on twitter and instagram @notastyles for a minute by minute update of this event. And to join in on the fun, when you facebook, tweet or instagram a picture or comment about this event use the hashtag #gjchristmas and maybe your image will be used in future publicity by this group!